This industry spin on the classical dilemma illustrates the games we play when software quality is at stake and gives insight into why software managers who forego quality in order to reach a short-term marketing advantage are actually acting rationally. In certain company, the topic of favorite programming languages can elicit the same response as other taboo subjects, such as religion and politics. But, Chuck's going out on a limb to discuss his new favorite language, D, and some of its best features, such as its being strongly typed and compiling to native code, yet it is garbage collected. Visit any bookstore these days, and you will be faced with shelves of books whose titles claim they can make everything—from cooking to exercise—more interesting. In our industry, boredom is a problem that can affect your ability to solve complex technical problems. Discover how change can spice up your software processes. Source code search engines can help you find chunks of reusable code. These search engines differ from generic text search engines by organizing the results to reflect the way code is organized—into functions, classes, packages, etc. These reviews of some popular engines can help you rev up reuse in your work. People get wrapped around the axle trying to understand the difference between incremental and iterative development. 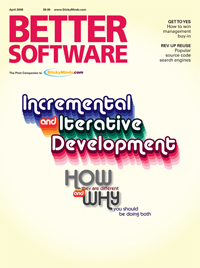 The Unified Process authors in the 1990s didn't help by indiscriminately calling everything iterative development. The two are different and must be managed differently. Successful teams do both at the same time, usually without thinking about it. Then someone starts thinking about it and does one without the other. Bad news follows. Systems and software aren't just about correctness; they are also about solving problems for people. According to the context-driven software testing movement, a problem isn't solved if the product doesn't work. Michael's experience in a hardware store drives that lesson home. You can't get your manager to give you what you want if he won't listen to you. Naomi suggests some strategies-including being methodical, gathering data, properly timing your requests, and practicing what you plan to say-that can help you make your case to the powers that be.